Steve Ciabattoni is the co-founder and CEO of 360 Payments, a payment technology company located in the heart of Silicon Valley. Raised in Philadelphia, Steve is the son of a small business owner who had to work two jobs just to put food on the table. Living the struggles of small business ownership firsthand gave Steve tremendous respect for entrepreneurs and fueled his passion for serving the small business community. Fresh out of college and looking for sales experience, Steve took a 100% commission job with a large credit card processor called Heartland Payment Systems. Much to his surprise, he fell in love with the payments industry. In it, he saw a way to empower small business owners to take control of their financial futures as well as the opportunity to use cutting-edge technology to streamline the customer experience. The industry was far from perfect, however, and as Steve sought to offer his customers more transparency, better rates, and excellent customer service, he realized business owners deserved another option – a payment processor who offered all these things and more. After a successful three-year tenure with Heartland, Steve teamed up with his longtime mentor and friend, Lisa Coyle to start 360 Payments. Since its inception in 2011, 360 Payments has grown to process more than $2 billion in credit card transactions with clients across the United States. Nearly 1,000 automotive repair shops alone now trust 360 with their payment processing. 360 stands out from the competition by offering full disclosure processing in a notoriously confusing and opaque industry, coupled with a very high level of customer service and a consultative approach to technology implementation. 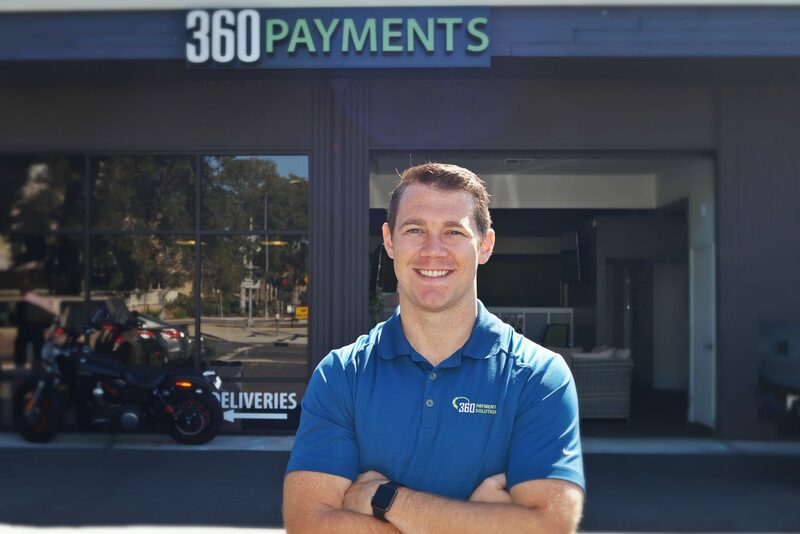 Steve is now focused on helping 360 integrate its Velox payment gateway technology with various shop management software systems in order to give independent automotive repair shops that “dealership feel” and improve their customer experience during the payment process. Steve currently resides in San Jose, CA, with his wife Michelle and their two young children. In 2015 a regulation came out to use chip card readers. If you do not use the chip reader, you may not have recourse against a challenge because of the Visa/Master Card responsibility shift. MC/VISA are forcing shop owners to upgrade to chip readers. Shop owners will not turn down the transaction with a good customer even if you don’t have a chip card reader. With security breaches, happening almost weekly, you cannot afford credit card data hitting your SMS (Shop Management System). Shops need to have a professional process in place to accept cards through an integrated process with their SMS. With integrated systems, the SMS will communicate the transaction amount to a terminal and the credit card machine will communicate to the processor. New devices cost about $300 – $400. You can also get signature capture integrated to SMS. Just one chargeback will make it all worth it. Do not lease a credit card machine. Read contract. Verify termination fees, they can be exorbitant. Look for no termination fees. There are hundreds of credit cards with many different rates. Processing company will bucket all fees. You are seeing the true wholesale cost of every card then you get their processing markup. Most companies will charge a PCI fee. A Payment Card Industry fee. Must be completed on an annual basis. But some processors are going to charge you a monthly penalty if you don’t complete this on a yearly basis. Banks make the most money in the entire credit card processing world. Banks take the risk from the consumer. Bank may make 1.5 to 2.5 percent of the transaction. How much are you paying for credit card fees? Take all fees and divide it by your credit card sales. Find an industry professional to help you with your credit card processing. Get the customer to pay before they show up. You know the cost of the repair so get your customer to pay electronically before they arrive. Scrutiny on PCI compliance will increase. If Equifax can get breached then the local shop owner could be. Firewalls are going to be critical. You’ll need tokens on your system to bring a higher-level security and protection. It is a record of truth for communication over the internet. Written in stone transaction with ultimate authentication. May not come to the automotive industry for a long time. Pay attention to your payment system. If you have a fraudulent transaction without a chip card machine you’ll have a tough time fighting it.